Majestically perched above Carter Creek with views of the Rappahannock River this custom home boasts uniquely inspired design and an open floor plan which is flooded by the evolving light patterns of the day and night. New high-end design by Architect, Randall Kipp who’s legendary flair for style and attention to detail are evident everywhere. 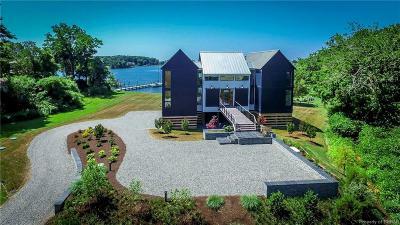 If one were to build a modern chateau on the water, this would be it! The zen garden prepares you for the serene luxury that you will enjoy inside. The inspirational use of light and appreciation for the creative and careful use of materials and space is evident everywhere. Gallery windows throughout the home maintains an unparalled warmth and comfort. The open kitchen with plein air dining area provides a fabulous entertainment venue with great transparency to the water view - one of a kind. This home is 3200 square feet with radiant heated porcelain tile on the 1st floor and heart pine hardwood on the 2nd floor. From the motor court enter into a two-story great room/kitchen with a whale bone roof structure and Spanish cedar paneling. This recently finished turnkey home is ready for you and your guests…visit today! !